Director's Office | News | Survey/Comments | Statements/Policies | Contact Finance Dept. 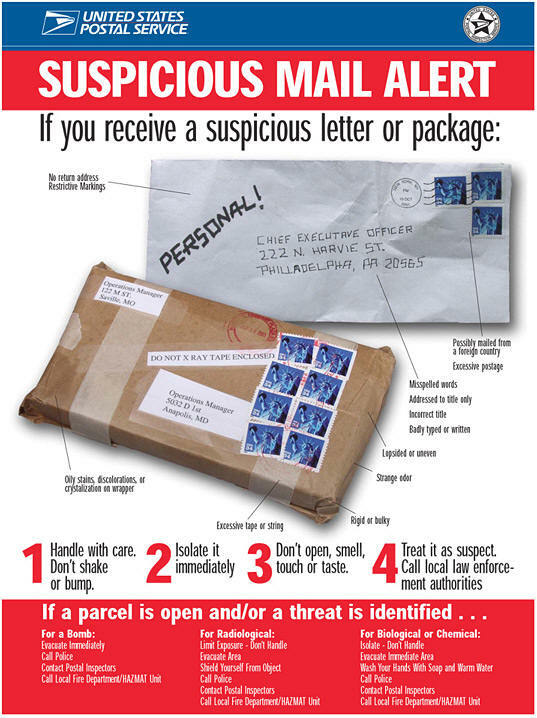 Most explosive devices are placed, not mailed. Therefore, our internal security plan provides procedures for both possibilities. Call Central Mail Operations at 334-353-0371 for a copy of a bomb threat check list. The poster reprinted below details the procedures we follow if a package is considered suspicious. The chances of receiving a mail bomb are remote. The chances are greater of receiving a telephoned bomb threat. 1. Keep the caller on the line, ask him or her to repeat the message several times while gathering other information such as caller ID information. Type the threat verbatim, using the caller's exact words. Do not hang up on the caller. a. What kind of bomb is it? b. What does it look like? c. Where is it located? d. Can you give me the floor and office number? e. What will cause it to detonate? f. Many innocent people may get hurt. Why are you doing this? g. What is your name and address?